Fundraising Cards - The Different Types, with Tips & Advice for Success! There are many different types of Fundraising Cards that can be used and some will be more profitable than others for your cause! And so, you need to think carefully about which type of cards will work best for your cause. Fundraiser cards are generally a good fundraising idea for most causes! They work specifically well though for Schools, Churches, Bands, Cheerleaders and other such small nonprofits. The purpose of this page is to showcase the different cards available, and to give you some guidance on how to get started with your card fundraising! These discount cards are what I call the WIN-WIN-WIN fundraiser! You win by raising funds, the merchants win with new customers, and so do your supporters through the discounts they get! It's a brilliant fundraising method! What you do is sell discount cards for popular retailers to your members, supporters and the public. To find out more about fundraising with Discount Cards read here. It's an article with tips on setting up and promoting your fundraiser effectively! OR to start a Discount Card Fundraiser now head over to GA Fundraising and get going. Scratch Cards are one of the most brilliant ways of acquiring donations from supporters and the public. It's fun, creative and rewards your donors through FREE coupon (discount) booklets. 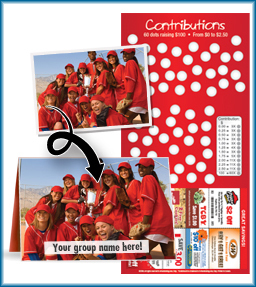 Each member in your fundraising team receives at least one Scratch Card with either 30 or 60 scratch dots on them. Each of those dots has a Dollar value hidden under waiting to be revealed through scratching. Your team then approaches people (explaining how the fundraiser works) and gets them to scratch a dot from the card. The value that is then revealed from under that dot is the amount that the participant has to donate to your cause. In thanks for their donation, they then receive a FREE coupon booklet. And then get your Scratch Cards here to get started! This is another highly successful form of card fundraising. All you do is sell Gift Cards and vouchers for popular retailers to members, supporters, and the public. It's a fundraising idea that is raising huge funds for many nonprofits, in particular for Schools! And for some Scrip Fundraiser success tips read here. Very similar to Scrip Fundraising, supporter cards are used by supporters at popular retailers in support of your cause. Essentially instead of them buying Scrip Cards, they will register for a shopping card that when used donates a certain percentage of the purchase to a selected charity or nonprofit! What your nonprofit needs to do is register as one of the beneficiaries, and get all your supporters to use those cards in support of you when they shop. It's a great idea that MySchool in South Africa has modeled exceptionally well. My recommended Discount Card and Scratch Card supplier. Grab their FREE information kit and guide! Another recommended supplier of Fundraising Cards. Well known Scrip Fundraising Broker/Centre. This fundraising ideas book is the most comprehensive ideas book that I have ever read. It's a highly recommended resource and reference for quality fundraising ideas. I promise to use it only to send you Fundraiser Buzz!.